In early October 2017, one of our dedicated members stepped into Awesome Flowers, a lovely flower shop on Grand Blvd in Vancouver. After a brief chat, the owner mentioned that he would like to help by providing flowers he can’t use in arrangements but were still in good shape. A plan was created. 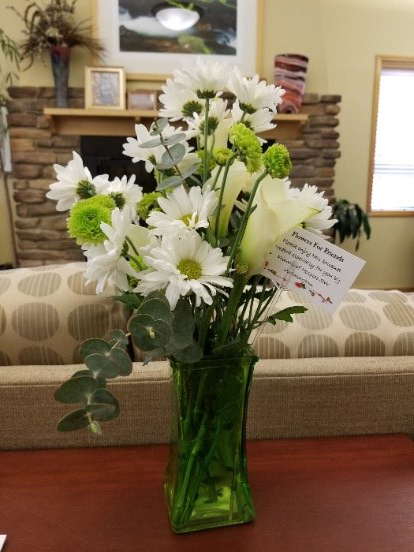 Every Tuesday the donated flowers are picked up at Awesome Flowers and delivered to the Elaine and Don Heimbigner Hospice Care Center and to the Ray Hickey Hospice House. The flowers are arranged in various containers and placed throughout the facilities. One day there was one red rose remaining. Instead of placing it in a little vase our volunteer remembered seeing a lady sitting in her wheelchair in the courtyard. Inspired, our volunteer went into the courtyard with the rose and asked the lady gently if she would like to have it. The woman was overcome with emotion as she cradled the rose in her hands and cupped the flower in her face. The family witnessed this and nodded their appreciation. It was immediately evident just how touching a red rose and seeing flowers in corners softens the impact of why they are there. If you are interested in helping us with this project, please contact us.